Security guards arrest Arabs attempting to sell unsupervised eggs to Jerusalem stores. Israeli security guards alerted the Ministry of Agriculture and Rural Development when they saw a vehicle pass a security checkpoint with what seemed to be a load of eggs. 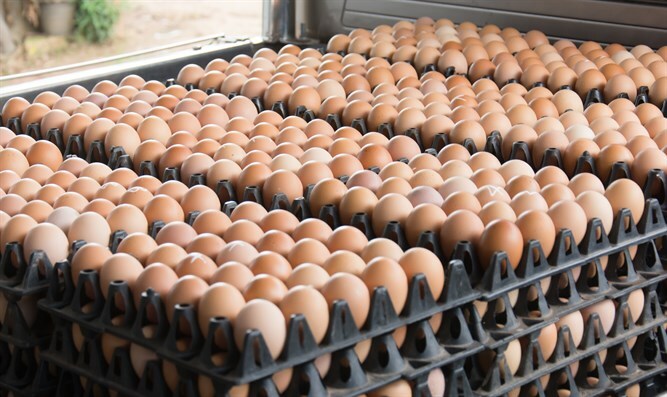 Upon investigation, inspectors found the truck to contain 4,500 eggs with fake stamps, transported at room temperature and in inappropriate conditions. Investigations show that the driver, a man in his 30s, intended to sell the eggs to stores in Jerusalem. Authorities arrested the suspect and began legal proceedings against him. They also confiscated the eggs, which will be destroyed. This is not the first time Israeli authorities have had to deal with Arabs smuggling unauthorized eggs into Israel. On August 1, Tax Authority supervisors, and Egg and Poultry Board members raided several businesses who were selling a total of 6,000 unsupervised eggs. In January, the IDF caught Arabs wearing IDF uniforms attempting to bring nearly 5,000 illegal eggs across a checkpoint. In June, Border guards caught Arabs attempting to transfer 9,000 eggs over the security fence and into arms of a waiting Israeli accomplice. The same number of eggs was found hidden under seats of a minibus in December 2016. In 2015, Israeli authorities arrested members of a large egg smuggling ring, and later that year seized 25,000 illegal eggs after they were feared to carry salmonella.